Commanding an elevated position overlooking the village of Chapeltown, Springbank occupies an enviable location with breathtaking views across surrounding countryside. This imposing Georgian residence built circa 1830 is steeped in history and has seen many changes over the decades. Built as the Vicarage and Sunday School for St Anne''s Church, Springbank was given its Grade ll listing in 1985 protecting the house and barn for future generations to admire. There are three sections to Springbank, the main house, a two storey cottage and the barn. The barn which is not currently habitable, is accessed via an inner hallway on the first floor of the main house and presents the option to renovate and integrate with the main dwelling creating further bedrooms or a large suite. The cottage which is not listed, is linked to the main dwelling via the rear porch off the kitchen. Arranged over two floors, the cottage is not currently occupied but has been previously used as an office and presents the option to renovate as a self contained annexe or link to the main house accommodation. There is access from the cottage down a few steps to a large double garage and wc. The property is secured by an intruder alarm system plus internal and external CCTV system. Behind the perfectly balanced facade, the original panelled door with fanlight opens onto the large entrance hallway with original coving, deep skirting boards and access through to the reception rooms. There are two principle rooms to the front, both with sash windows overlooking the gardens and driveway. The large living room to the right with Parquet flooring has access through patio doors at the side, this room is not shown on our photographs but has been stripped back and ready for someone to decorate to their own style. The second reception with ornate plasterwork ceiling and original coving, Adam style fire surround with open fire has double doors opening onto the formal dining room with exposed stonework and feature fireplace. There is access from the dining room out to the side patio and also through to the hallway and kitchen. 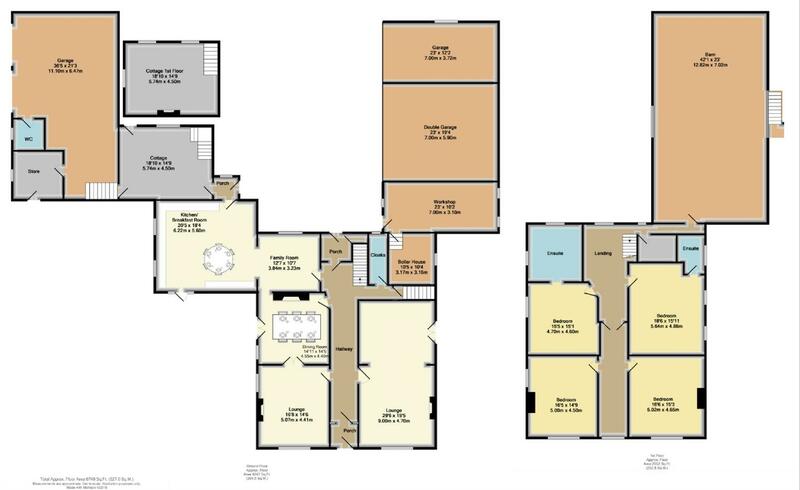 The kitchen/family room is a superb space with defined areas for cooking, relaxing and entertaining. There is access out to the patio and also via the rear porch to the cottage and rear courtyard. Off the hallway there is a ground floor wc and access down to the cellar. The staircase with half landing leads to the spacious split level landing area and access to the bedrooms. There are four double bedrooms, all of which have superb views over surrounding gardens and countryside. 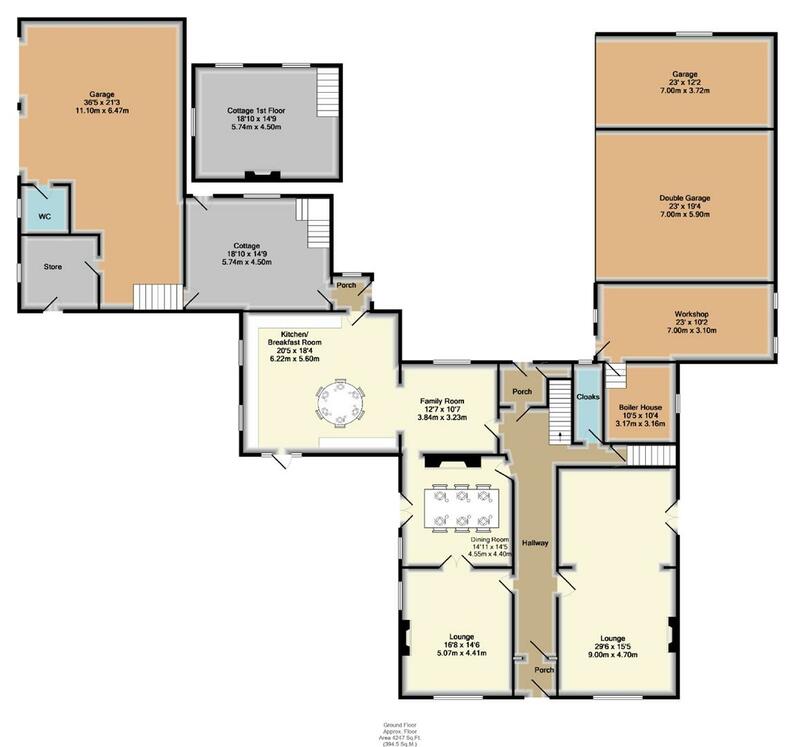 The two bedrooms on the lower landing have En-site bathrooms. 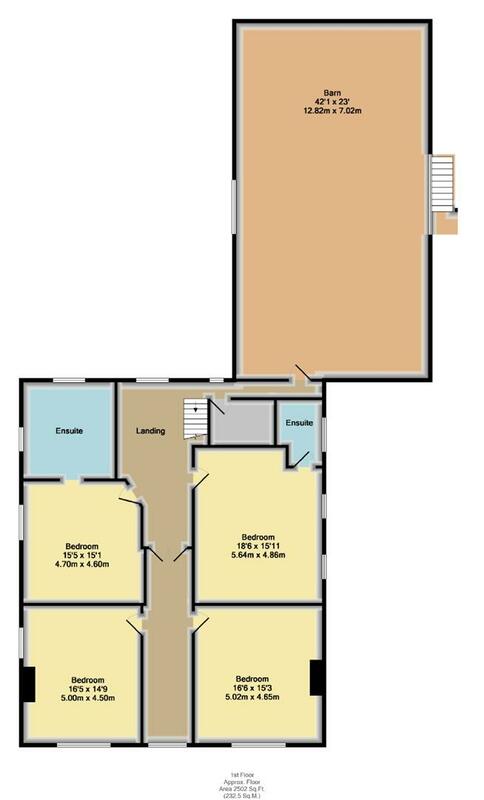 Bedrooms two and three are at the front of the house and accessed via double doors on a raised landing area, there is potential to create a large suite with bathroom in this area. Private grounds surround this magnificent building with a formal lawn to the front, patio area off the kitchen, perfect for entertaining and a sunny courtyard to the rear, also accessed off the kitchen. There are five garages, three underneath the barn along with the boiler room plus two on the far side of the cottage. Spring Bank is situated fringe of the much admired village of Chapeltown, far from the hustle and bustle of daily life yet within easy reach of schools, rail network and everyday amenities. For those with a love of the countryside, this is the perfect setting with many picturesque walks on the doorstep including The Wayoh and Entwistle reservoirs. A private road leads to Spring Bank and one other dwelling, the sweeping gravelled driveway leads to the front of the property whilst a further driveway leads around the barn to the courtyard, garages and the cottage.